The Kentucky Museum will Participate in the Bowling Green Gallery and be open extended hours on Friday, October 12th from 5 to 8 PM. Kentucky Museum will be featuring Charles Brindley paintings in an exquisite exhibit, Salient Features: Trees of Old Forest and Woodland Pastures. Charles will be conducting an artist walk-and-talk beginning at 5:30PM. In addition during this Gallery Hop visitors are encouraged to take a look at the ongoing construction of Patrick Dougherty’s Stickwork on the Museum’s front lawn. The Kentucky Museum is a founding member to the Bowling Green Gallery Hop which is a unique collaboration between the city's independent and non-profit galleries, museums, and studio centers. 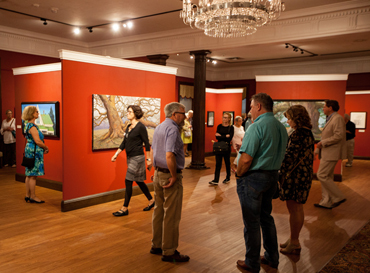 The Kentucky Museum and other art venues freely open their doors with extended hours for five Gallery Hop evenings per year.